My trip to Shanghai went swimmingly. It kicked off with W3C Tech, which was a thoroughly lovely event. I gave my talk—The Design Of HTML5—with the help of an excellent interpreter performing consecutive interpretation. It was my first time experiencing that—I had previously experienced simultaneous interpretation in Spain and Japan—and it was quite a good exercise in helping me speak in complete, well-formed sentences (the translation usually occurred at the end of a sentence). Once my talk was done, I took some questions from the audience and was then showered with good wishes and tea-related gifts. 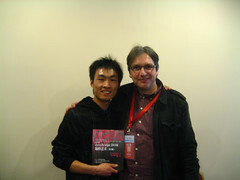 They really made me feel like a rockstar there; I’ve never had so many people want to have their picture taken with me or have me sign their copies of my books—the publishers of the Chinese translations of DOM Scripting and Bulletproof Ajax were also at the conference. W3C Tech was held on the east side of the river so I spent the first few days in the futuristic surroundings of Pudong. 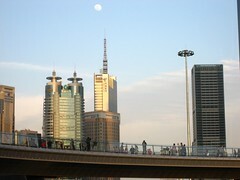 Once the event wrapped up, myself and Jessica moved across to a more central location just off Nanjing road. I quite liked the hustle and bustle, especially once I remembered the cheat code of “bu yao!” to ward off the overly-enthusiastic street merchants. I wish there were something similar for the chuggers here in the UK, but I have the feeling that the literal translation—“do not want!”—will just make me sound like a lolcat. Anyway, I had a great time in Shanghai, doing touristy things and taking lots of pictures. 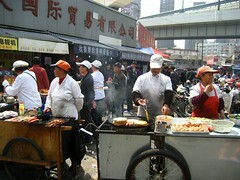 I particularly enjoyed getting stuck in at street-level exploring the markets, whether it was electronics or food. 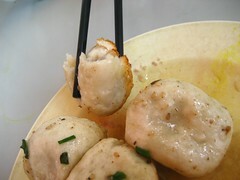 The fried dumplings—sheng xian bao—were particularly wonderful. I plan to deliver a full report over at Principia Gastronomica. So long, Shanghai. ‘Till the next time. There is little to do on the bus ride from Brighton to Heathrow other than to listen to an iPod. So that’s exactly what I did on Thursday morning, using the time to catch up on some podcasts. I listened to a Radiolab short called Pass the Science featuring the author Richard Holmes. Robert Krulwich positively raves about his book The Age of Wonder . Immediately after that, I listened to an interview with Freeman Dyson. I had to grit my teeth through the climate denialism to get to the good bits about his spaceship designs. During the interview, the subject of books came up. I knew that Dyson occasionally reviewed a book or two, having read his article about James Gleick’s The Information . He mentioned that one of the finest books he had recently read was … The Age of Wonder by Richard Holmes. The coincidence was too much. I decided I had to have this book. I jotted down the name of it in my notebook. Then I remembered …I had my Kindle with me. Risking motion sickness, I turned it on just long enough to navigate to Amazon and download the book, overcoming my loathing of its hateful DRM. Just to recap: based on recommendations received through audio signals sent from a handheld device that stored time-shifted conversations, I connected to a global network of machines to exchange currency and download a file onto another handheld device—all whilst travelling in a moving vehicle. Living in the future feels pretty cool. It was even cooler when I entered a heavier-than-air metal craft that was capable of counteracting the force of gravity long enough to take me halfway around the world in just half a day. Wandering around Shanghai in a semi-jetlagged state also feels like living in the future—given timezone considerations, I kind of am in the future—and it also feels pretty cool. The problem with seeing so many new sights and experiencing so many new experiences is that I have grown used to sharing them with the world via Twitter. Alas, the Great Firewall of China was forcing me to go cold turkey. But then Jessica discovered something: it turns out that the 3G Kindle can circumvent China’s censorship (for now). My feeling of disconnectedness vanished the moment I pulled up mobile.twitter.com and saw the beautifully mundane updates from my friends across the world. I still hate the DRM and I still have issues with the ludicrous pricing models of digital books but that’s twice now in as many days that the Kindle has given me something more than just a good reading experience. It’s been good to be back in Brighton—especially over the past few days while Tantek has been around—but now it’s time for some more travel …and nipping up to the first day of UX London doesn’t count. 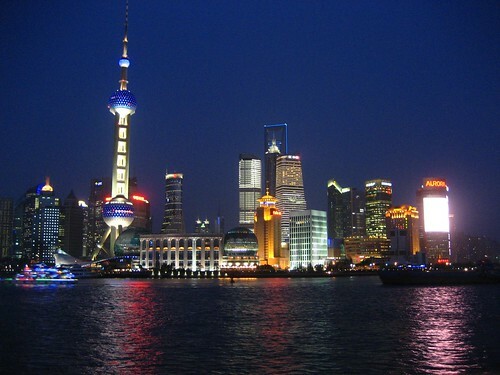 Ostensibly, the reason I’m going to Shanghai—I just like repeating that—is to speak at an event called W3C Tech this weekend. But I’m not about to turn around and hop on the first flight back, so I’m going to be spend the week afterwards being a tourist. I fully expect to culture shocked but I’m really looking forward to this. So many things to see! So much food to try! If you’re familiar with the megacity, I’d love to hear your suggestions. Feel free to leave a comment (that’s right: comments!) and assuming adactio.com isn’t blocked by the great firewall of China, I’ll check out your recommendations. Oh, and on the subject of the dodgy web situation, I’m guessing you won’t be seeing any Twitter updates from me for a while. Also, if you send me an email, you probably won’t get a response any time soon …that’s got nothing to do with censorship; I’m just crap at responding to email.